Leipzig Town Plan, 1720. Start at the bottom right-hand corner. 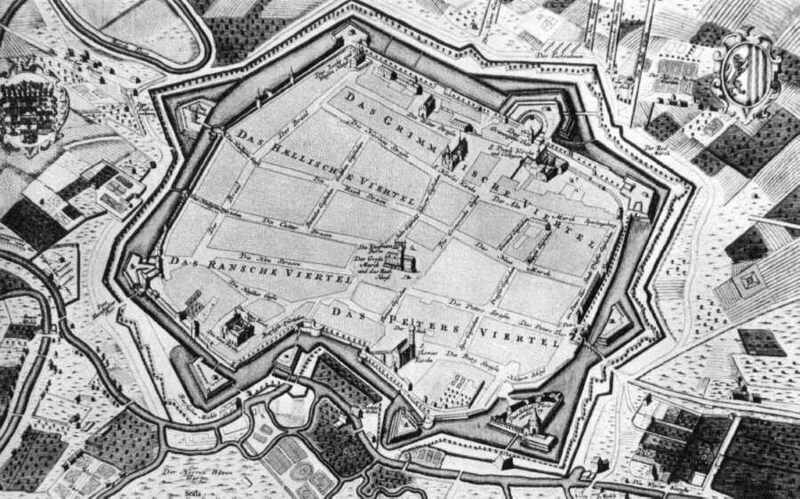 Here you have the Vestung Pleissen-burg, built as a fortification. Burg means fortress, and the Pleisse is the river on which Leipzig sits. A little to the left is the Thomaskirche; just on the right of it, the Thomasschule. Bach looked out over the "moat" to the Promenade; he also had ready access through the little Thomas Gate. Moving upwards from the Thomaskirche we find the Market Place in the center, with the Town Hall. To the left is the Cather Strasse with Zimmermann's Coffee House. Carrying on upwards and slightly right from the Market is Grimma Street leading to the Grimma Gate. To the left of it is the Nikolaikirche. Outside the Grimma gate was a garden in which Bach's Collegium Musicum played in summer. The dominant roof and tower in the center mark the Thomaskirche. The large building slightly to the right of it and seen end-on is the Thomasschule. Note the height - this was after the 1732 remodeling and enlargement when extra floors were added. Bach looked out over the more formal city park to the rural scene beyond (which Goethe would later describe as idyllic). He would leave the inner city through the Thomas Gate with its own bridge connecting to the fashionable Promenade. Beyond were a number of extensive formal botanical gardens, the two earliest being laid out by the celebrated horticulturist Georg Bose in 1700, with the later addition of Herr Breiter's Garden which included a substantial glass Winter Garden. Further out were the rolling meadows along the Pleisse River. Here we see the main locations where Bach lived and worked. On the left, the Thomas School and Thomas Church. To the extreme left, off the picture will be the "Little Thomas Gate" through which Bach could access the Promenade, the Formal Gardens and the countryside beyond. He lived and worked in the School building along with the choir. Note the date of this engraving is 1723. At that time the School building was old and decrepit, damp and unhealthy. In 1730-1 it was remodeled inside, additional upper floors were added, and the building was given a fashionable new facade. Bach is normally associated with the Thomaskirche. 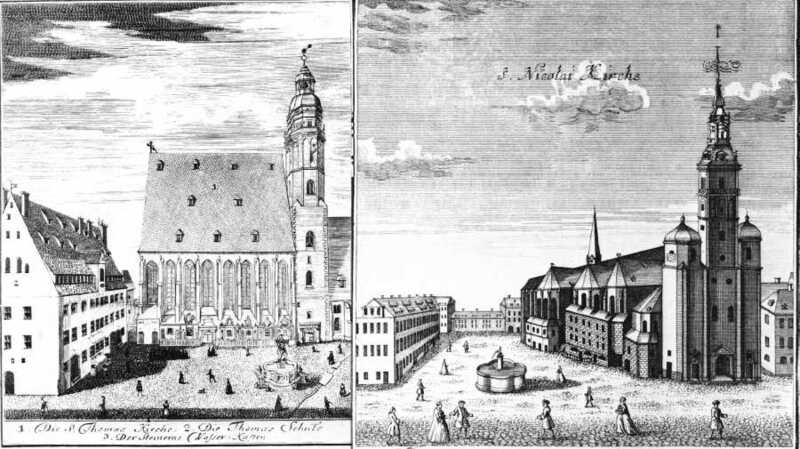 It is not so widely known that in fact the Nikolaikirche (at right) was the Hauptkirche, the Head Church of the Town and the Seat of the Superintendent. Bach's first cantata performance as Cantor was given on May 30th, 1723 in the Nikolaikirche, as were subsequent Council Election Cantatas. Sunday cantata performances were given alternately in the two churches, as were special works for festive days. On the left is the architectural drawing of the "with much improvement rebuilt Thomas School Anno 1732". Bach's living conditions thereafter were much improved! On the right is "a part of the Cather(ine) Street". Zimmermann's Café which hosted Bach's Collegium Musicum was located in the center building labeled "2". It was in a fashionable street... and in good company! The Hohmann House on the left was the Military Governor's Residence, while the house on the right belonged to a Doctor Schacher. Note the quality of the buildings, the paved streets, and there was public lighting at the street intersections and on important buildings. During the mid-1700s approximately one-third of all the inner-city buildings were remodeled or rebuilt. Such was the quality of Leipzig's building facades that Amsterdam publisher Peter Schenk produced a book of engravings in 1722. The Waterworks Building was situated on the Pleisse River. The giant water wheels did not drive stone corn-grinders, but 50-foot high pumps (see section on right) which pumped a mix of river and spring water up to the header tank in the roof. This gave the necessary pressure to drive the water down, and through a network of pipes (Röhrenfahrt) which fed reservoirs in squares throughout the city. Ladles on chains (Schöpfwerke) were used to draw up water from these reservoirs. 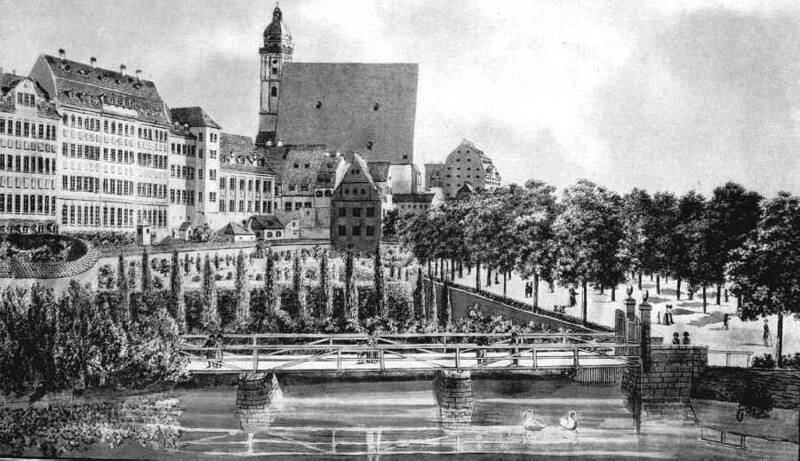 A network of "water mains" had existed in Leipzig since 1504; its precise location through the city's streets is still preserved on plans held by the city today. Some important buildings were connected directly to feeder pipes; during the 1720s and 30s there was much redevelopment in the City, and new buildings were all connected to the water supply. Leipzig's eight Coffee Shops played an important role in the social and musical life of the city. 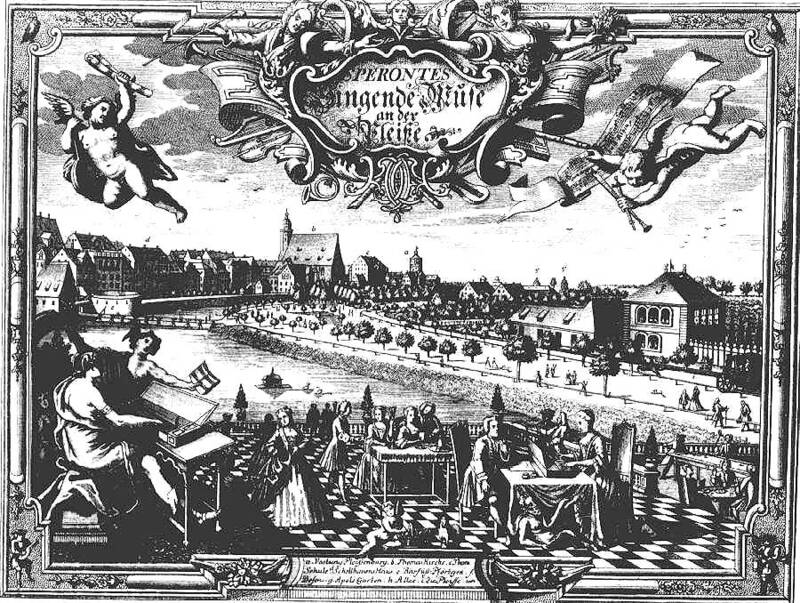 We end this brief tour of Bach's Leipzig with an idealized view of Richter's Coffee garden which nonetheless captures the lively cultured atmosphere of the city in 1736 when this frontispiece to the Song Collection "The Singing Muse by the Pleisse" was published. Note the variety of activities - conversation, spinet-playing, cards, and yes, bottom right - snooker! Elegant, cultured, sophisticated, commercially prosperous, cosmopolitan... this was the city in which Bach and his family were fortunate in spending twenty-seven years. Illustrations, with captions (trs from German) taken from: Bilderbuch aus der Geschichte der Stadt Leipzig, Verlag Zieger, Leipzig 1897 in possession of the editor. The reader is welcome to copy without any restriction. illustrated story, full cantata text, and music samples.